Bikes are an inexpensive, fast, and efficient way to deliver goods. The city has laws and rules to help make commercial bicycling safer. Administrative Code of the City of New York §10-157 and §10-157.1 pertain to businesses that use bicycles for commercial purposes. Failure to comply with these laws and rules may result in a fine. 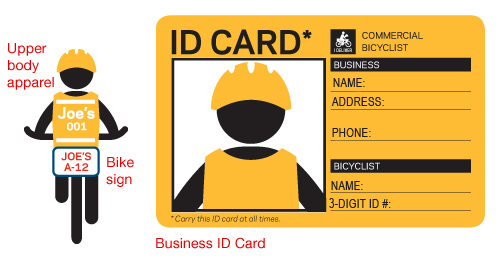 The law requires that each commercial bicyclist have a unique three-digit number for ID purposes. 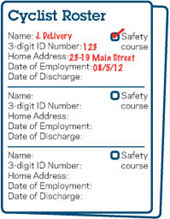 If someone leaves, business owners may reassign that number, and record the change in their log. 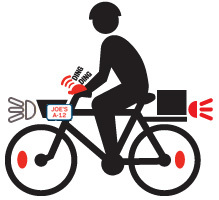 Commercial bicyclists must wear retro-reflective upper body apparel with their three-digit ID number and the business name on the back. Any garment, such as a jacket or vest, will be in compliance as long as the business name and ID number are legible, and it is retro-reflective. Hanging bags from handlebars is not recommended. 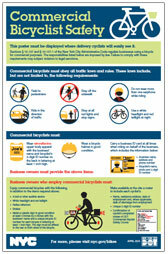 The best way for business owners to help their employees safely carry deliveries is to provide a basket or pannier. DOT's Commercial Bicycle Unit will enforce §10-157 and §10-157.1 of the Administrative Code of the City of New York while inspecting those businesses using bicycles for commercial purposes and in response to 311 complaints. NYPD will continue to enforce both traffic-related moving violations against bicyclists and §10-157 and §10-157.1 against business. The New York State Department of Motor Vehicles does not register electric bicycles, therefore their operation is prohibited in New York City. Only pedal-assist bicycles can be operated in New York City. This page reflects recent amendments to §10-157 and §10-157.1 of the Administrative Code of the City of New York, effective on September 27, 2017. The legislation related to this law is available from the City Council.